Rome is a city that should never be visited once. Eternal in the truest sense of the word, it's monuments, people and traditions span the ages and the city's influence, the globe. 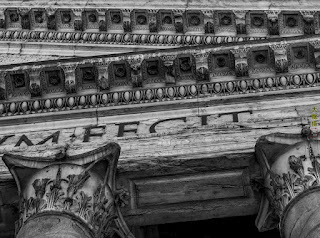 Rome's innumerable sites of unique cultural value and interest, means that to recommend one would be to exclude another. 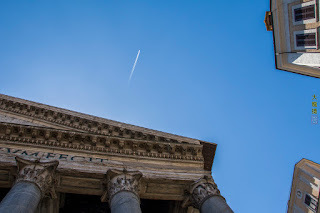 However there is one, which stands out above all the rest, one that uniquely encompasses all of Rome's glory and history and tradition, and that is the Pantheon. It's very name is a myth which goes back two millenia. The historian Cassius Dio calls it pantheon, not because it was a temple to all the gods, but rather because it's dome embraces all the heavens. The inscription above the columns proclaims that Agrippa made this temple. But in reality what we see today is it's third incarnation, after it was burnt down twice before, there is much doubt as to how much it resembles Agrippa's original. 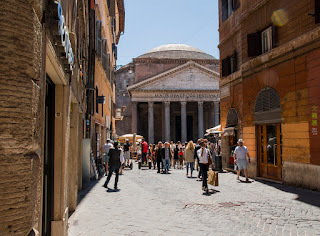 Reached by narrow alleys, surrounded by crowding townhouses and fronted by a smallish square, the pantheon doesn't really fit into a complete view. From street level, you only see the portico, it's dome barely visible. From a distance, it is only the dome that can be discerned. It looks at first unassuming, resembling a stack of upturned dinner plates. But take a second glance and, you realise that it does stand out. The dome's concentric circles sliding slowly into a shallow semi-sphere of grey concrete are something ancient, like nothing ever before, and nothing ever since. The same is the view from the street. The portico's columns defy erosion with their bluish tinge. 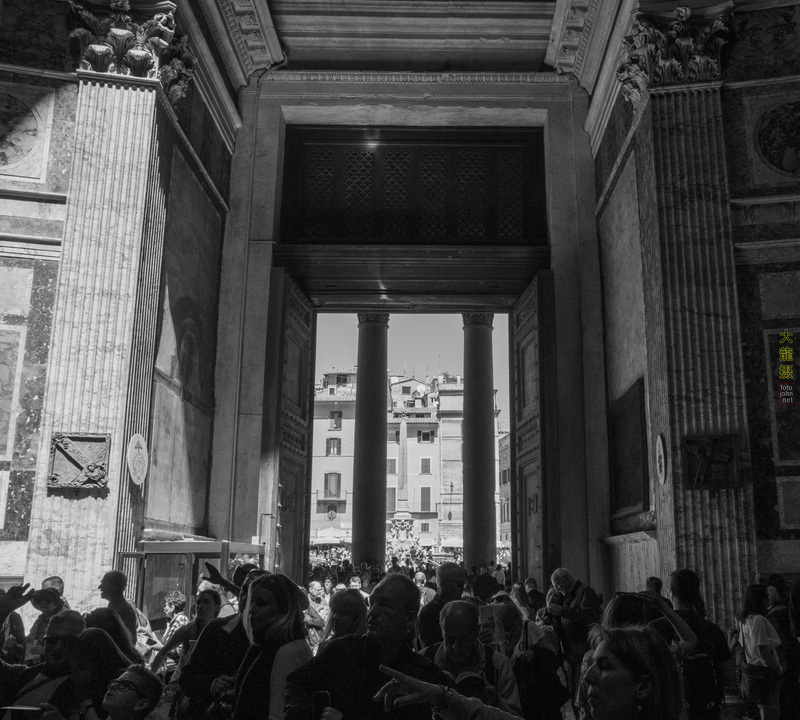 The two massive arched niches on either side of the door defy the Holy Trinity, their absent statue-gods and other-worldly proportions define a time before Christianity. 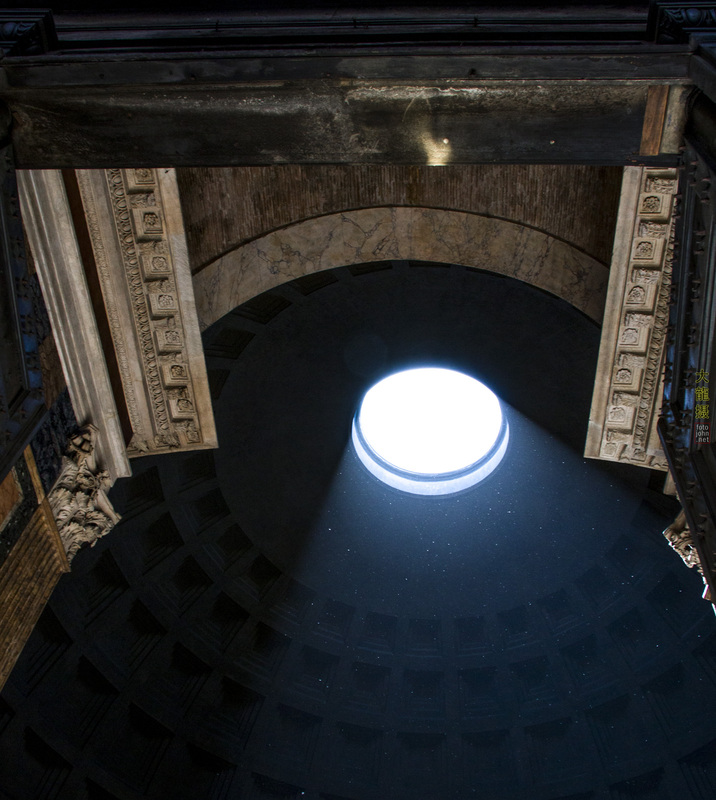 As Cassius Dio opines, it is the dome that makes the Pantheon. Once inside, you do not need to look twice to appreciate this. The Oculus is open to the heavens, and burns a whole in the darkness that surrounds it in a perfect, massive semi-circle. The ray of light that descends, creates a spotlit circle which moves with the day across the deep, rich marble. It is no wonder that the design of the dome is so advanced that this building still holds the record for the world's largest unreinforced concrete dome. 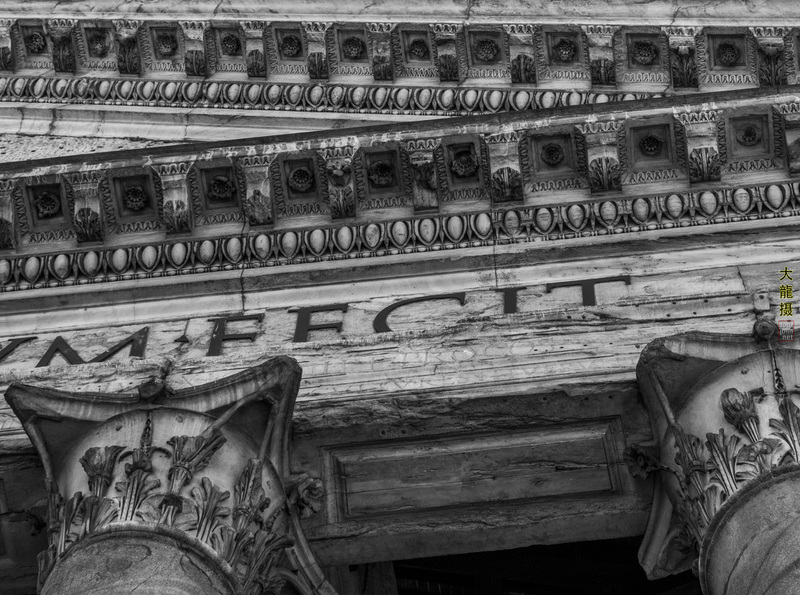 Whether it be out of reverence for such beauty and engineering skills, or out of fear that too much modification would cause it all to collapse, the Church's mark on the pantheon is only decorative, with its altars, statues, and king's tombs. The Pantheon's scale and proportions are Roman, it's design Roman, the light and acoustics, Roman. When you step into such a place, you are stepping into a building which is unlike anything else on earth. Everything about its design transcends time, and as a result its presence transcends space - with the way it fits so neatly yet indefinably into the modern and changing city. The Pantheon is the reason why Rome is a city that should never be visited once.